The design of the Alero was originally previewed in 1997 with the Alero Alpha concept car, a V6-powered sport coupe that featured many design elements seen in the production Alero as well as some that were never meant for production. The Alero was sold either as a 4-door sedan or as a 2-door coupé. It shared its chassis and many parts, including engines, with the Pontiac Grand Am, the other compact N body sedan. All Aleros came in base GX, mid-level GL, or high-end GLS trim; GL trim was split into three levels: 1, 2, and 3. The Alero experienced minimal changes during its 5-year run. Most of these changes were either in choice of engines or options. 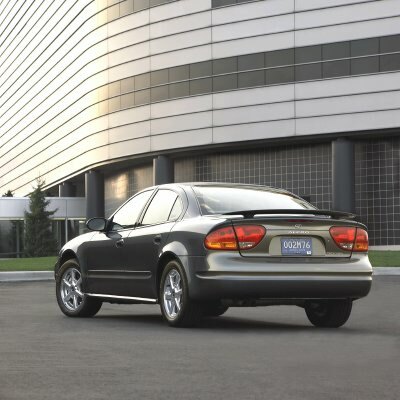 In 2003, the Alero's daytime running lights were changed from high-beam to low-beam. The Alero was also sold in select countries in Europe as the Chevrolet Alero, and was only available as a sedan. The car still featured its Oldsmobile badges even though sold under the Chevrolet brand. Since most European consumers would not recognize the badging, Chevrolet badges were added to the grille and rear fascia for the 2000 model year. Since the phase-out of the Alero, it was replaced in Europe and Canada by the GM Daewoo-sourced Chevrolet Evanda/Epica. The Alero's production ended with a special Final 500 Edition. These last 500 Aleros featured custom graphics inspired by vintage Oldsmobile logos, dark cherry metallic paint, and a plate featuring the car's number out of 500. The final Alero Final 500 Edition (#500 of 500), a GLS 4-door, also happened to be the final Oldsmobile ever built, and was signed under its hood by the employees of the General Motors Lansing plant and then given to the R.E. Olds Transportation Museum. A preview of the planned replacement for the Alero was seen in 2001 with the unveiling of the Oldsmobile O4 concept, designed by Bertone. The car was an open top 4-seater with European styling but some Oldsmobile traits, and powered by the latest Ecotec I4 engine. The name had multiple meanings, including "Oldsmobile 4-Seater" as well as implying the year 2004 as a planned date for production. Unfortunately, the O4 concept was unveiled a few weeks after General Motors announced that they would be phasing out the Oldsmobile brand, meaning that production possibilities of the O4 would never become reality. Because of this, a second generation Alero was never built and the car was phased out with the Oldsmobile brand in 2004.